I had an amazing revelation this past week. There is an egg pie sort of thingy that is fantastically delicious that you don't have to make a crust for and comes together in a matter of minutes! Maybe to you this is old news, but I just made my first frittata and am basking in the enjoyment of it! I absolutely love quiche, but I rarely make them because not only are they fattening (hello, pie crust!) but they are somewhat labor intensive (hello again, pie crust!) and they take a long time to bake! Beautiful and delicious for special occasions, but not really an every day or even every week kind of thing, you know? 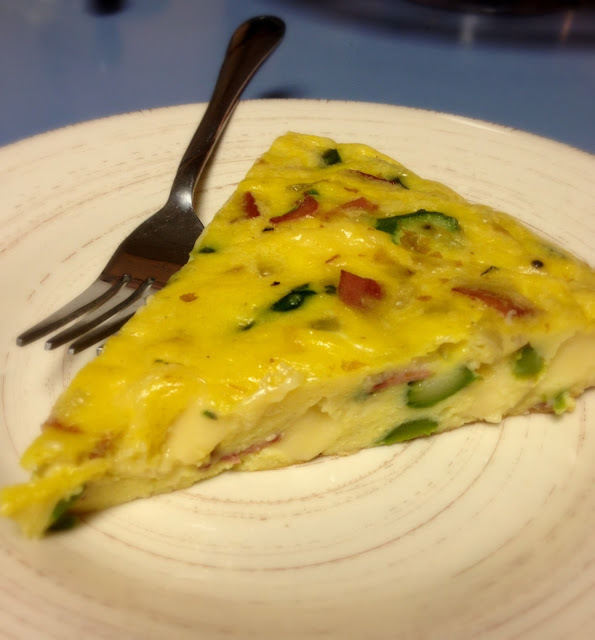 So, all that to say- frittata is quiche's low maintenance cousin! On a side note, my spell check is at it again. This time it wants to change "frittata" to "irritation". Oh, yes, let's serve up a little irritation for breakfast! Sounds delightful, doesn't it? "What's on the menu, honey?" "Oh, just a little asparagus, bacon and Gruyere irritation, dear!" Way to get my man to the table, spell check. Not only is it pleasing to your nostrils as you saute the asparagus, bacon and shallots, but also to your eyes- vibrant yellow eggs dotted with spring green asparagus and crisp bacon. Oh! and don't forget your taste buds! One of the most delightful things about this bright dish is the way the Gruyere stays in little gooey pockets, spilling forth melty goodness in each bite! 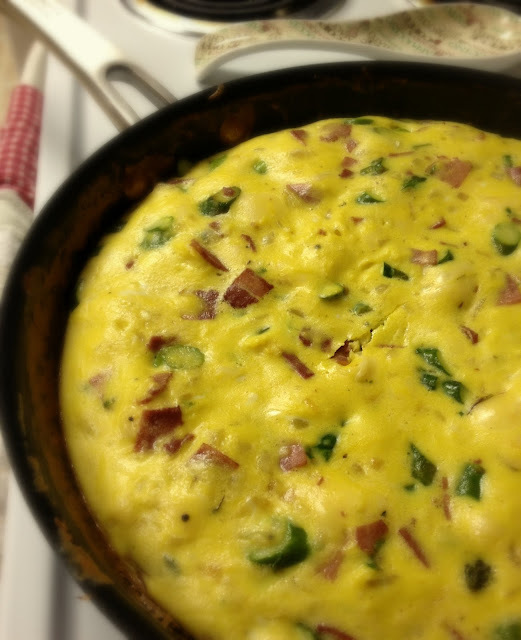 Whether you choose to serve your frittata for a holiday, a weekend brunch or a quick weeknight dinner, let's just say that it will get your man, or your family, or your company, or the president of the United States to your table much quicker than any "irritation" would. In a medium bowl, whisk together the egg, half and half, salt and pepper until completely combined. Set a 12 in. nonstick, oven safe skillet over medium heat. Add the oil and when hot, throw in the asparagus and bacon. Cook, stirring occasionally, until the asparagus has lightly browned and is nearly tender, about 3 minutes. Add the shallot and cook just until slightly softened, about 2 minutes. Add the cubes of cheese to the egg mixture and stir. Pour egg mixture into the skillet with the asparagus, bacon and shallot and cook, using a rubber spatula to stir and scrape the bottom. Large curds will begin to form after about 2 minutes, but the eggs should still be quite wet. Shake the skillet to distribute the eggs evenly and allow to cook for 30 sec. without stirring- this will set the bottom. Transfer the skillet to the oven and cook until the frittata puffs and the surface browns slightly, 10-12 min. Check for done-ness by cutting into the frittata with a paring knife. If the eggs are firm, but just slightly wet, it's ready. Pull the skillet from the oven and let stand for 5 min. 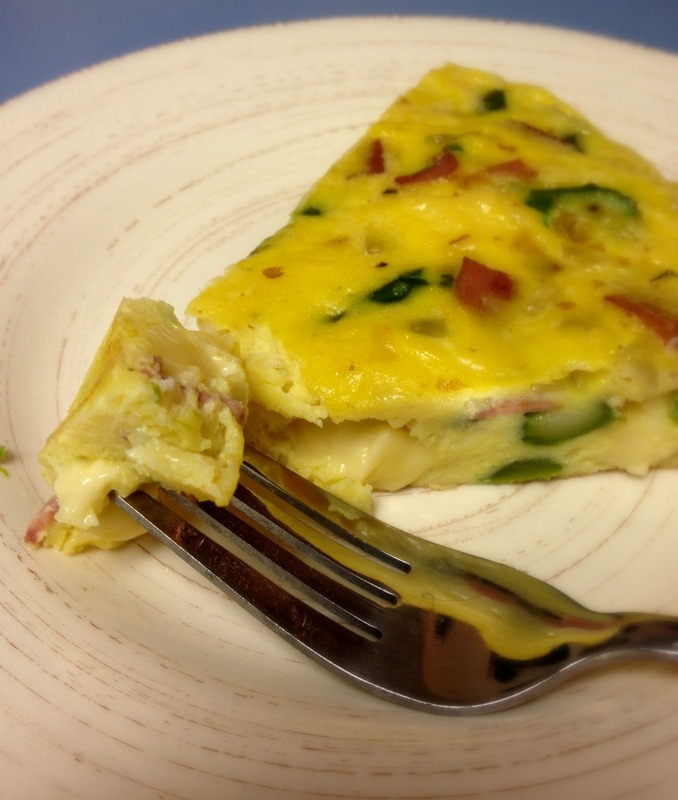 Loosen edges with the rubber spatula, then slide the frittata out of the pan and onto a serving plate. Cut into wedges and serve.